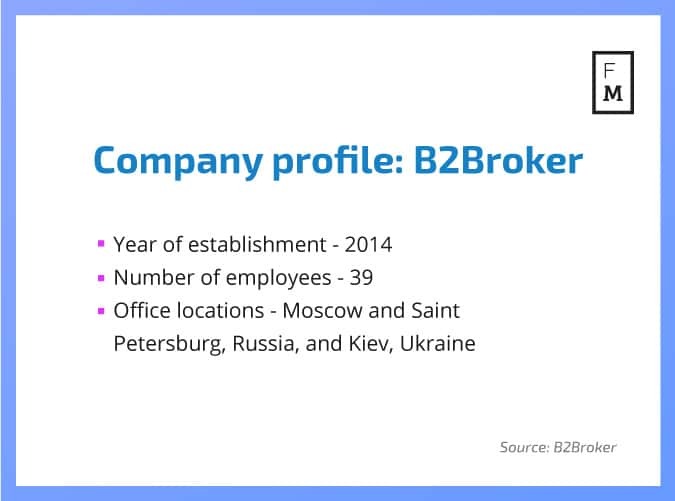 Evgeniya Mykulyak talks about the industry and what makes B2Broker stand out. Finance Magnates sat down with Evgeniya Mykulyak, the COO of B2Broker, to talk about her position in the company, the state of the industry, and how B2Broker intends to provide liquidity to brokers. I started my career after receiving a master’s degree in International Economics and later received a MBA in project management. Now I am the COO of B2Broker. Before joining the company I worked as a project manager in the department of business development in an international brokerage for three years. The B2B segment was completely new for me: there are different products, a different approach, different tasks and goals, so the transition to B2Broker was a challenge and an opportunity at the same time. On the other hand, thanks to my past experience I know how brokerage companies work and I understand the difficulties they have to face in terms of services, infrastructure and products. In other words, I know what brokers need and how to make their lives easier. The online trading industry is rapidly evolving. For example, a young little-known company may find it difficult to strike an agreement with a major liquidity provider. It is next to impossible to create a high-quality client area in-house, while trading platform and server maintenance cost a pretty penny that could be spent on marketing and business development. I have often observed how sales managers, inspired by the success of their company, left to start their own businesses. Almost all of them failed, because it is not so easy to start a brokerage company from scratch as it might seem at the first glance. Professional support is vital. And indeed, the brokerage business is full of pitfalls and it is much easier and safer to start it together with the professionals. Initially, the company positioned itself as a provider of technological solutions for forex brokers, we offered mostly software products. However, as the business evolved, our product range expanded considerably, we have changed the focus and now our flagship product is the advanced liquidity solution based on Integral system. In the next few years, we plan to work in this direction to find our niche in the market as a liquidity provider. We primarily focus on Asian markets, including Japan and China, and Arab countries. Our goal is simple: there are about 4000 brokerage companies working in our target markets. So at least 10% of them should become our standing customers within a few years. Apart from the external goal, we plan to expand the number of our IT specialists to 50 and make the company more prestigious and desirable in the eyes of employees by creating comfortable working conditions and fostering a corporate culture. Our competitive advantages can be expressed in three words: comprehensiveness, quality and flexibility. Companies operating in our niche tend to sell useless software packages or separate products, forcing the customer to buy essential add-ons and extensions. Our key difference and advantage is a truly integrated approach. Even the minimal starter package includes all products and services necessary for a successful and hassle-free start on the market as a forex broker – from the idea to the first customer. The same principle applies to our services that are easily integrated and do not require any modifications – all is included. Our technical support is available 24 hours a day, seven days a week, and it solves all the IT-problems on the client side. In fact, brokers get at their disposal a convenient client area, first-class liquidity and other services together with a staff of experienced IT specialists, ready to come to the rescue and solve problems at all times. What’s more, B2Broker sells only its own products. We do not buy decisions from other developers and certainly do not plagiarize. This approach allows us to make really high-quality products and take responsibility for them. All our solutions undergo multi-stage checking procedures. They are tested until the quality division identifies and eliminates all the flaws. Another distinct advantage is flexibility. If the customer does not need a whole package of services, we offer separate solutions, depending on the customer’s needs. Customer comfort and efficiency are among our top priorities, that is why we always strive to accomodate their needs, offering different options. In other words, with B2Broker you have everything to become a broker and even more! The online trading industry is rapidly evolving. Businessmen, managers and successful traders often think of starting their own brokerage business, which has already moved far beyond creating call centers. Modern broker is an intermediary that provides traders with liquidity and offers favourable trading conditions. The success of the brokerage business depends on the speed of execution, spreads and fault tolerance of the whole system. These are the factors considered by traders who choose a brokerage company. Now we strive to evolve as a liquidity provider. This is our top priority.